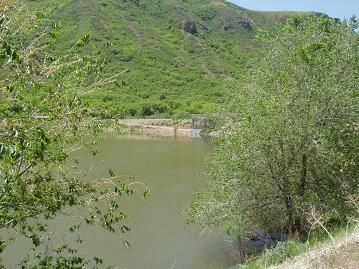 Hobble Creek is a small stream located east of Springville in Hobble Creek Canyon. It holds a resident population of small brown trout and is also stocked periodically with catchable sized Rainbow Trout by the Utah DWR. It gets fairly heavy use by campers and bait anglers in the summer months, however is often deserted during the colder winter months of the year. In late summer you can do well with live grasshoppers (the small sizes) or even some live caddis nymphs (aka rockrollers) collected from the stream. 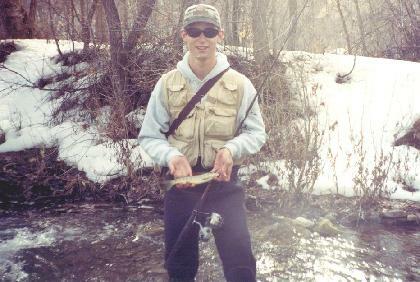 Flyfishing is also popularon this small Utah County stream, although traditional fly casting is difficult on this small stream due to its thick brush and overhanging trees in most areas. Roll casts or simply flipping your fly upstream can be effective. 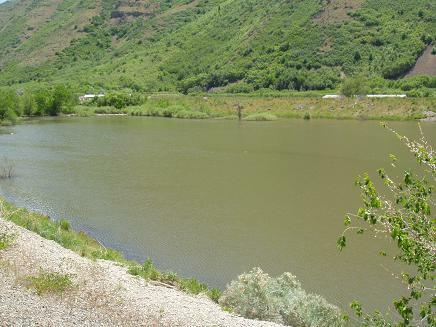 Hobble Creek Catch Basin is located approximately a half mile from the mouth of the canyon, and for part of the year, provides a nice little place where people can take their kids to fish for planted rainbow trout. The catch basin is drained in midsummer for irrigation water use, however all spring and part of summer it is usually full and fishable. Bait and small shiny spinners are usually the best methods here. Take I-15 to Springville (Exit 260). Turn east and go 3.3 miles to an "All-Way" stop sign. Turn right (south) and go approx. 2.5 miles to the Hobble Creek Catch Basin. To fish the river, continue on and fish anywhere publicly accesible.